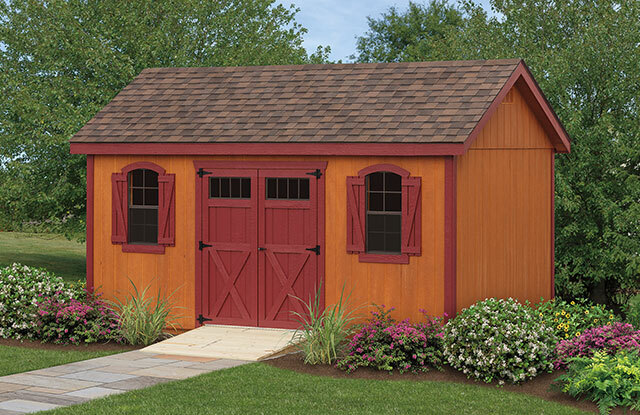 Emulating the original style of sheds that have been used by property owners throughout Maryland and Delaware for years, the Kountry Series offers a cozy, rustic look coupled with plenty of storage space. Our Amish-crafted Kountry Shed Series comes standard with transom windows in Duratemp sheds or 4-lite fiberglass doors in vinyl sheds. Models with Tru Cedar siding, which are complemented with dual brown roofs with burgundy trim, combine the authentic wood with the added durability and energy efficiency of steel. Additional options include: classic vents, flower boxes, and arched window trim. © 2019 Amish Structures. Web Design by WebTek, Lancaster PA.